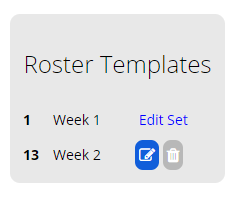 The roster template is your first step in the roster process, this guide will explain how to create a template and save it to a week. In the top right corner, you will see the manage templates button. Here you can create templates, select a template for editing and save templates to weeks of the fiscal year. 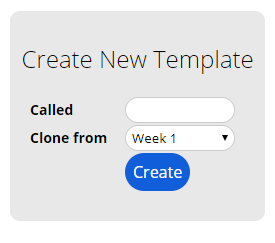 Create your first template by entering an appropriate name and click create. Each roster template is used to house all roster data for a particular time period. For example, a rotating roster could be named Week 1 and Week 2. Or you might have a Summer and Winter roster. There is no limit to how many templates are created. Each template includes all locations of your business, review the Locations guide before proceeding. Be sure to fill out your first template as your second template can be created from any previous template. 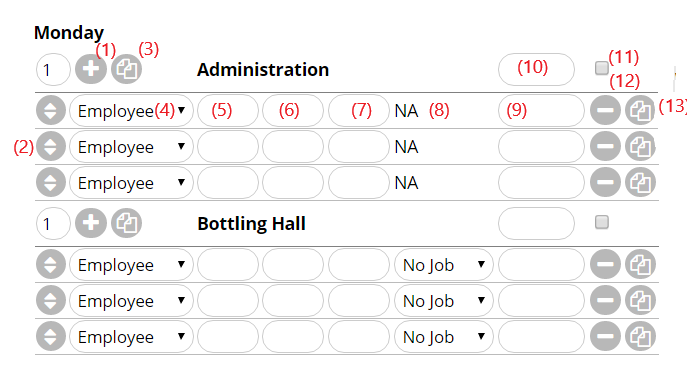 In the manage templates area, you can select which roster template you would like to edit. Templates can also be deleted here, once a template is deleted this cannot be undone. 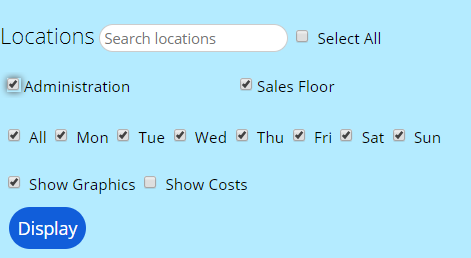 Select the locations you would like to display, we will select all locations and click display. Now there are two location options for every day of the week. Start by adding the required number of shifts to each location, for this example, we will add 3 to each. Press the + button (1) to add the required number of shifts. Now we will fill our shifts with some data to see how this is displayed in the display area. Make sure you have added your employees first, review the Add new employee guide if you have not yet done so. Works a standard work day with a break (Administration). Starts his day in the office then moves onto the sales floor. In this example he has been rostered on from 9-12 (Admin) and 11-17 (Sales floor). The end of the first shift is after the start of the next shift, thus there is a clash of one hour that's impossible and highlighted in red. An amendment should be made to correct this mistake. Has a split shift on the sales floor, from 9-12 and 14-17. There are 3 types of unavailable hours that will be displayed on the roster. All unavailable hours are displayed in pink on the roster. If a set shift clashes with the unavailable hours it will be highlighted red. Mouseover the pink areas to see why an area has been marked as unavailable. In each employees profile you can set their available work hours. For example every Saturday morning James plays football. We can enter this into his available hours. If we roster him on during this time a clash will be displayed. We might choose to roster someone else on or we might know James has a bye this week and choose to ignore the clash. If an employee is rostered on from 8 to 12 then they will be made unavailable during that period for all other shifts. If we try and roster them on during that period, a clash will be displayed. An employee can request time off (annual leave, sick leave or unpaid time off). Leave requests will be displayed on the roster. If you roster the employee on during their leave period a clash will be displayed. Leave requests will only be displayed on the roster calendar. You can set a budget or hours goal for your roster template or roster calendar. If you know how many hours it will take to complete a particular job you can aim for that. The cost goal can be a budget target for a department or can be a projected income of the business. With a target budget you can aim for a cost percentage less than 100% of the budget. If a projected income is entered the cost percentage will be the employee wages as an expense of the business, example 35% might be a goal. The hide costs button can be used to show/hide cost. This can be restricted to selected employees. 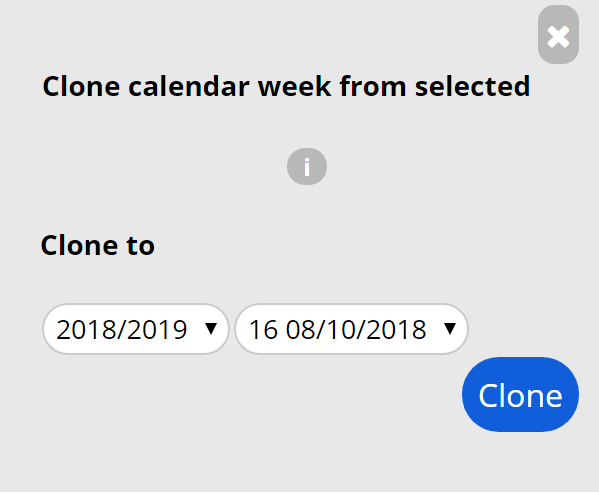 From the manage templates area, you can clone the template to the calendar. When you are happy with your roster template you can clone it to a particular week of the fiscal year. The next week of the fiscal year will automatically be selected. You can save your rosters for an infinite number of weeks into the future. If a template is saved to a calendar week that has already been saved to, the previous roster data for that week will be over written by the new data.